Update 10/26/12: Check out this new version fully updated for iOS 6! Note from Ray: This is the eleventh iOS 5 tutorial in the iOS 5 Feast! This tutorial is a free preview chapter from our new book iOS 5 By Tutorials. Enjoy! This is a blog post by iOS Tutorial Team member Felipe Laso, an independent iOS developer and aspiring game designer/programmer. Adding some social features into your apps can really help you increase the virality of your app, help you identify and retain customers, and can boost the polish and added value of your app. 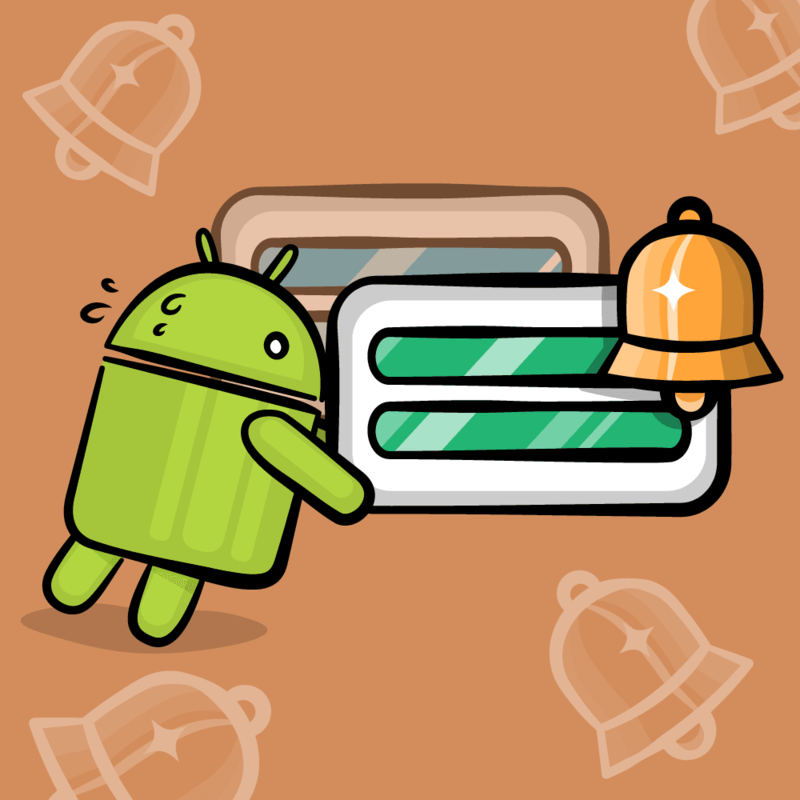 Until now, adding social features into apps has been a pain. Not only do you have to use a different API for each social network, but users have to constantly log into each one of them for every app they use. I can’t remember how many times I’ve had to log into Facebook or Twitter within a game or app. It can get quite tedious both as a developer and as a user to repeat the same thing over and over again for every application, up to the point where users won’t even bother because they don’t want to have to log on again. 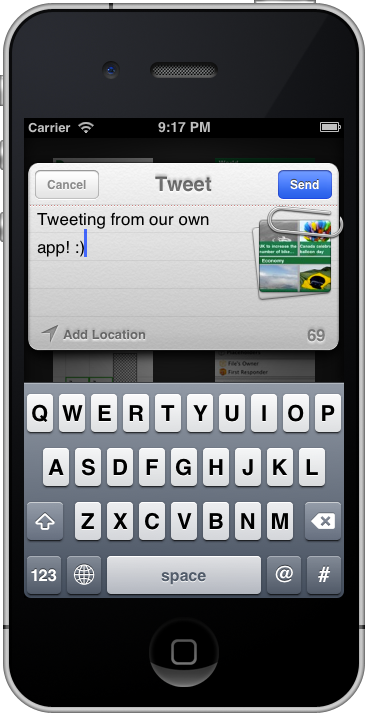 Thankfully for us Apple has taken a huge step forward in this regard by having Twitter natively incorporated in iOS 5! Now all a user needs to do is log into Twitter once and each app can make use of your accounts stored on the device. Keep reading to see how simple it is to use, and an example of integrating it into a simple app! iOS 5 includes several ways to interact with Twitter. 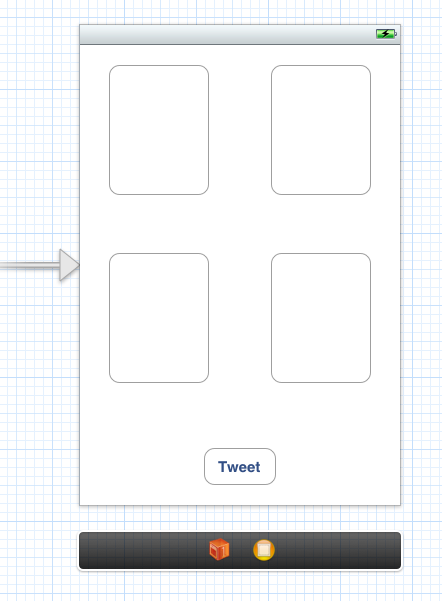 The simplest, and possibly the one you will most likely implement, is the TWTweetComposeViewController. That name is quite a handful so we will affectionately call it “Tweet Sheet” just as Apple does. All you do is determine whether the device can send tweets, create an instance of the tweet sheet, attach any links or images, put some initial text and present it modally, that’s it! All within Xcode and through the use of Objective-C.
As you can see we have lots of advantages and incentives to use this and, being that it’s so simple, there’s no excuse not to include Twitter functionality in your applications! Alright fellow programmers, it’s time to get our fingers typing and creating an awesome Twitter enabled app. In this example we’re going to create a simple app that will allow the user to tweet whatever text they like, and even include images or links within their tweet. 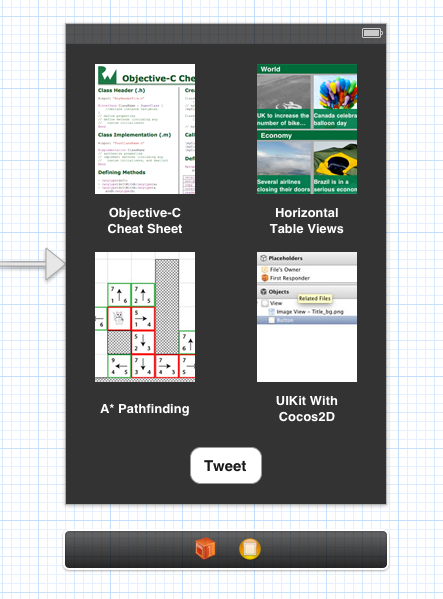 Create a new project with Xcode with the iOS\Application\Single View Application template. 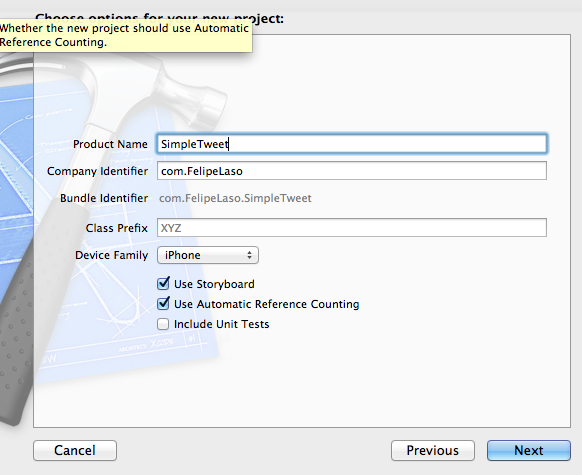 Enter SimpleTweet for the product name, set the device family to iPhone, and make sure that Use Storyboard and Use Automatic Reference Counting are checked (leave the other checkbox unchecked). Go ahead and click next one more time and select a location where you want to save your project. Now that we have our project created let’s discuss a bit of what it’s going to do. Our app will allow the user to enter the text for their tweet as well as show some buttons for including an optional image and link on their tweet. We have four large buttons which the user will be able to toggle in order to add an image and link to their tweet. Compile and run and make sure everything looks ok so far. Now onto the implementation! Next we need to make some connections from our storyboard to the view controller. Open MainStoryboard.storyboard file and make sure the Assistant Editor is visible, and displaying ViewController.h. Yes, believe it or not that’s all we need to do in order to send a tweet (mind you we haven’t included any links or images), it doesn’t get any easier than this! Let’s go over the code we added to our tweetTapped method. First thing we do is check to see if we can send a tweet, we accomplish this by calling the canSendTweet class method on TWTweetComposeViewController. This method will return NO if the device cannot access the network or if the user hasn’t setup a Twitter account yet. If our application can send a tweet then all we do is create an instance of the TWTweetComposeViewController, use the setInitialText: method to load up the tweet sheet with some default text and present it modally. 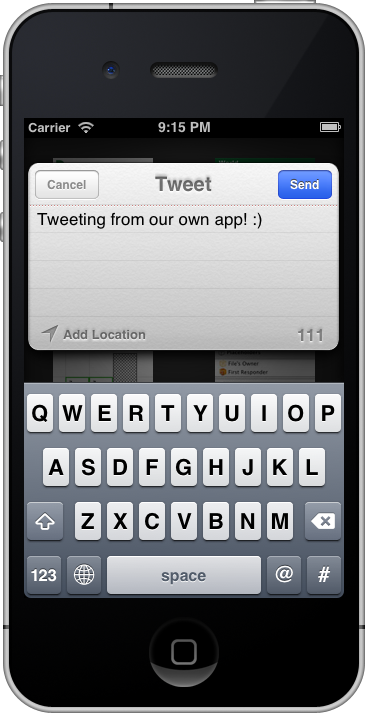 If we cannot send a tweet then we just show a simple alert view to provide the user with feedback. There is one thing worth mentioning and that is that the TWTweetComposeViewController has a completion handler property which you can use to pass in your own block of code once the tweet sheet is dismissed. All we are doing here is creating two private string properties to store the image’s name and the link to the tutorial website as well as a private method to set our labels’ text color back to white. The way we are going to implement this is as follows: when the user selects a tutorial we store its image name and link within our private properties and we set the label’s color to red in order to indicate the current selection. 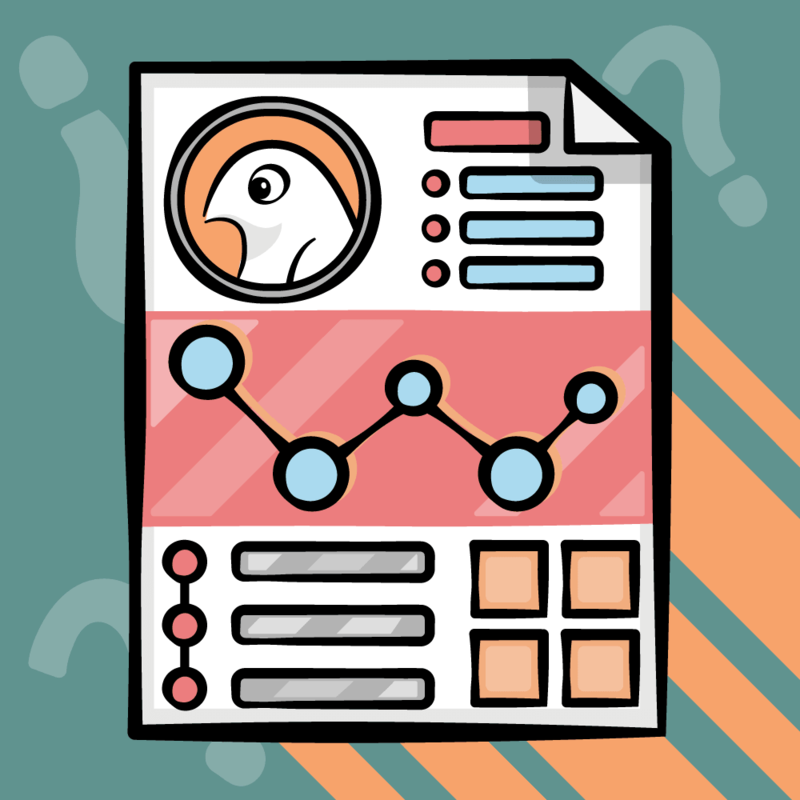 In each of the methods we just clear the labels, set the image string to the appropriate image, set the URL to the corresponding tutorial and change the label’s text color to red. 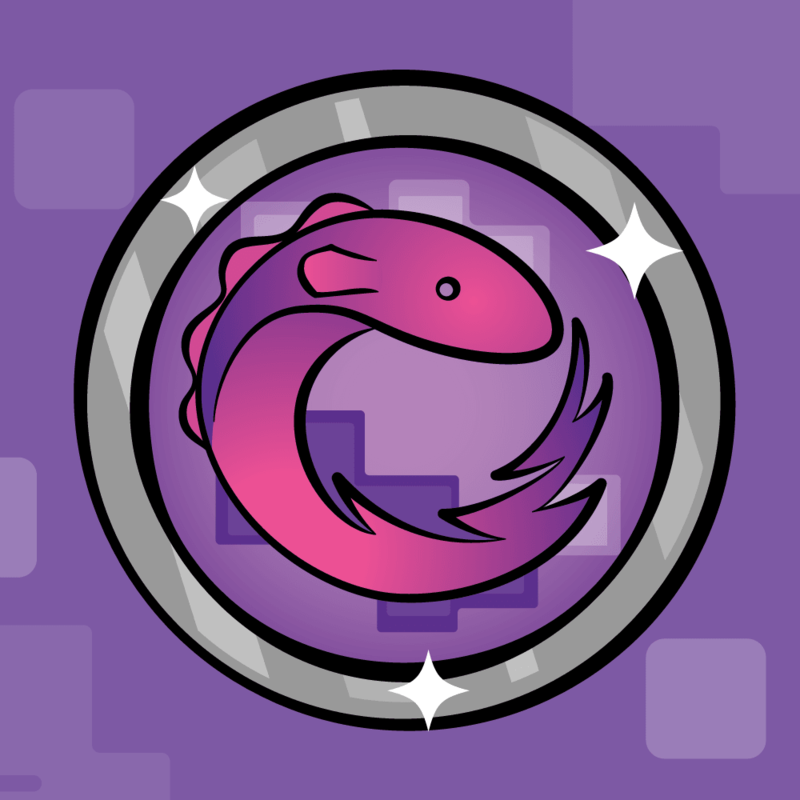 We could have implemented things a bit differently in order to avoid writing the same code in all 4 methods but since this example is very simple, we’ll leave it at that. We just added two if statements to check whether we have an image and url, if we do then we just add them to our tweet sheet by using the addImage: and addURL: methods respectively. If you look at the tweet sheet you will notice a paper clip with 2 attachments, one is the link to our website and the other is the image we added. When the user sees the Tweet, they’ll see two URLs in the tweet – one for the image, and one for the link. Try it out and see what it looks like! You could try and experimenting with things a bit, perhaps dynamically setting the initial text of the tweet sheet depending on what tutorial was selected, or even include more images or links within your tweet. If you want to do some more cool stuff with Twitter, check out our book iOS 5 By Tutorials, where we have another chapter that covers how to use the Accounts framework as well as how to access Twitter in order to acquire information such as mentions, messages, a user’s feed and more!